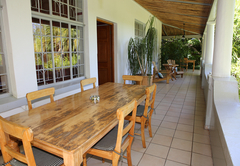 Bains House is a 4 star graded guest house with self catering option, offering Upington accommodation for tourists and visitors of the Green Kalahari. At Bain’s House tranquility meets timeless elegance. 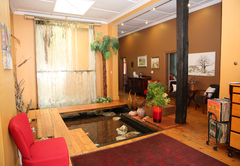 The moment you enter the guest house through the big double doors you are greeted by an unexpected sight of an indoor waterfall and fishpond. 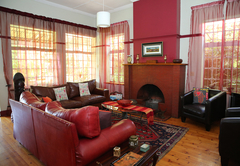 The cozy lounge with the big fire place where you can sample our local wines, the verandah and the magical garden. The lounge leads onto a long verandah with a reed ceiling. Sipping you first cup of coffee on the verandah, you have a view over the lush garden with a black swimming pool and the Orange River valley where the fish eagles circle the skies. Space has become a luxury. 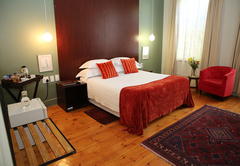 Our spacious en – suite bedrooms with all the conveniences that you need include satellite TV, free internet access, a bath and shower, cookies, tea and coffee, flowers and the latest magazines. 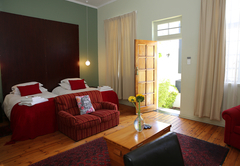 This large main suite has a beautiful view over the garden and the Orange River Valley. The spacious bathroom has a big oval bath. This is a spacious room with en-suite bathroom. This room is also inside the main building. 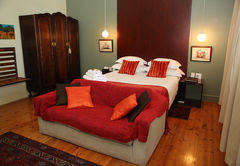 This deluxe room has the same features as all the other luxury rooms, but is situated outside the main building. This makes the room extra private. 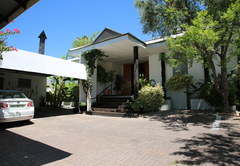 Self Catering/Family Unit: 1 Double & 1 Twin Room. A Kitchenette and an indoor braai. Breakfast can also be enjoyed in the house. 2 Standard Double rooms outside the house. Each with an en-suite bathroom. Awake to the smell of fresh coffee brewing in the breakfast room where breakfast is severed daily. On arrangement Kalahari cuisine is served by our chef. Only 1km from CBD AG Bain’s House offer you peace of mind with a secure parking area. 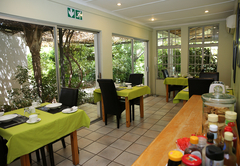 Our location makes your visit to Upington one of comfort, peace and quiet. Airport transfers, tourist maps, traveler information are available from you hostess. 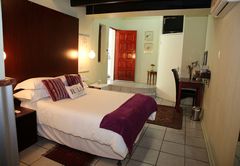 Large main suite with beautiful view over the garden and the Orange River Valley. Spacious bathroom with big oval bath. This room is ideal for honeymooners and executives. 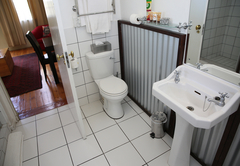 A spacious room with an en-suite bathroom. Our spacious en-suite bedrooms with all the conveniences that you need include satellite TV, free internet access, a bath and shower, cookies, tea and coffee. 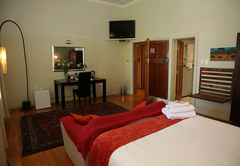 A spacious room with en-suite bathroom situated outside the main building. This makes the room extra private. 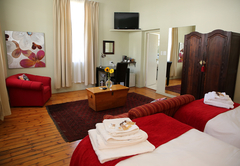 Our en-suite bedrooms include satellite TV, free internet access, a bath and shower, cookies, tea and coffee. 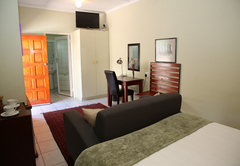 This is our self catering family unit made up of 1 Double room and 1 Twin room. 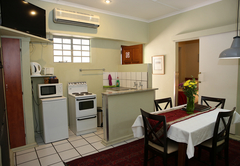 It includes a kitchenette & Indoor Braai. Breakfast can also be enjoyed in the house. 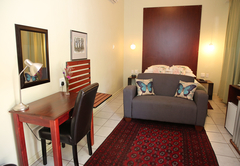 Standard Double Room with double size bed and en-suite bathroom. 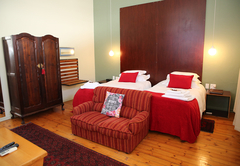 Our en-suite bedrooms include satellite TV, free internet access, a bath and shower, cookies, tea and coffee. 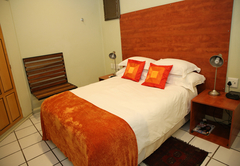 Standard double room with queen size bed and en-suite bathroom. 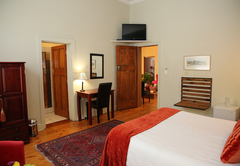 Our en-suite bedrooms include satellite TV, free internet access, a bath and shower, cookies, tea and coffee. Excellent stay. Friendly staff, lovely room, can't complain at all. I was very satisfied. We recently stayed at Bains Guest House and what a pleasure, the cleanness, attention to detail and service were the best we had in our journey in South Africa, and we stayed at a few 5star places! The rooms are equipped with everything you need and more, the cookies were still hot out of the oven and delicious, the chocolates homemade and creamy there were even a little card telling us the weather for the next day, much to my wife’s delight. The swimming pool were a bonus on a hot day. Breakfast were served outside and all the fruit were fresh and crispy (the first place to have fresh fruit on an overnight place after traveling for 3 weeks) and hot breakfast served to perfection and not to oily. I have taken a lot of card s and will give them to all your friends coming to South Africa! Thanks Bains House for making us feel special in all ways. Response timeBains House typically responds to requests in 5-10 minutes.